If you have ever been to one of these prestigious international fast food chain restaurants, I am sure your mouth must have started watering. This is nothing but the spell of McDonald’s and Wendy’s Hamburgers which has bewitched people all over the world! And perhaps, this has been the reason due to which both Wendy’s and McDonald’s today stand among the top 3 largest international fast food chain restaurants of all time. The two giants follow mainly the franchise business model to run their restaurants. Let’s compare and contrast the two leading restaurant companies. ‘Wendy’s - Old Fashioned Hamburgers’ was founded toward the end of year 1969 by Dave Thomas along with John T. Schuessler in Columbus, Ohio, USA. McDonald’s, on the other hand, is a much older company as its birth year goes back to 1940, when the two brothers Richard and Maurice McDonald opened a ‘speedee service system’ restaurant in California. In fact the establishment of this ‘speedee service system’ of by McDonald’s gave rise to the fast food restaurants concept. The menu of Wendy’s has hamburgers, chicken sandwich, french fries and Frosty as its main items. Frosty, a form of soft serve ice cream conflated with frozen starches is a typical Wendy’s product. The Wendy’s Hamburgers are typically square and old fashioned. The company claims to use only the fresh ground beef square patties instead of frozen patties in the burgers. 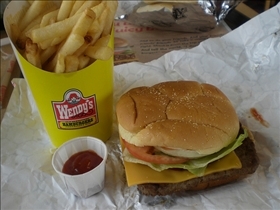 The squared hamburgers and the beverage ‘Frosty’ are the main reasons behind Wendy’s popularity. The main products of McDonald’s are also the hamburgers, chicken products, french fries, cheeseburgers, soft drinks and desserts. The menu of McDonald’s has been altered in most of the locations with the inclusion of healthy items with high nutrition value e.g. salads, fruits and other vegetarian items, wraps etc. McDonald’s is also known for its region specific products in the purview of local traditions and taste. At present, McDonald’s serves nearly 47 million consumers a day through its 31,000 plus restaurants in 119 countries, which makes it the largest restaurant chain in the world! Wendy’s on the other hand has far fewer restaurants (6,650 approx.) 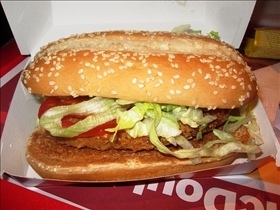 than McDonald’s and is the third largest fast food restaurant chain, the second place being occupied by Burger King’s. According to a recent inventory study of the two companies, the McDonald’s goes through its entire inventory every 3.8 days whereas the same figure for Wendy’s is 9.1 days! McDonald’s and Wendy’s are among the top 3 largest fast food chain restaurants. McDonald’s is one of the oldest in the business whereas Wendy’s is relatively new. Both the companies have Hamburgers, Chicken products and French Fries as their main products. Wendy’s is popular for its old fashioned square Hamburgers and the beverage Frosty. McDonald’s restaurants are located at more than 31000 locations across the globe. Which fast food chain has a better burger? MCDONALS IS BETTER AND MORE POPULAR! Wendy's is better because it's more healthier, consistent, and everything is fresh whereas McDonald's lacks appeal of their burgers and lacks freshness. While they may have chicken nuggets with less calories, there is still a lot left to be desired at McDonald's. I am in current contact with someone who had worked there a few years ago and he told me that he had gone out to get the meat, which the company that McDonald's gets it from leaves it on the porch in the back without ice or any cooled packaging, and there were maggots in the meat but McDonald's used it anyways. he shortly quit after this. Wendy's is definitely a better tasting homemade burger!! Please take a grammar course before posting unreadable comments. Wendy's is better because it is more savage than McDonald's. McDonald's doesn't do sign wars like Wendy's does. sure wendys burgers are tiny and leaky, but at least they aren't made of mealworm paste and filler.